Georgina Wilson buys lots at Muji, Angel Locsin on the rescued Chilean miners, Maria Ressa on being Esquire’s Sexiest Filipina and more. - Hope everyone stays safe despite the impending typhoon!! - basura,lagay na po natin sa tama. Nasusuka na mga kanal. Ayoko na mag-surf sa baha.. O kaya sa dagat ng basura. Ganda ng Pinas! Ano baaaa!!! - Days of speculation and debate. Thank you for your thoughts, Tweeps! Thank you to Esquire for an unorthodox choice. Brave new world. - The other side of the coin of course, is that Beeto could be looking at me and thinking "what did I do to deserve such a strange dad?" - What’s so great Is seeing how organized, deliberate and precise the way the rescue of the Chilean miners is being carried out...and look at the faces of each and every single person on that platform, they know exactly what to do. Now this is good crisis management. - A beautiful lesson Chile taught us: :’Basta’t magkaisa tayong lahat, pwedeng magtagumpay kahit ano pang sitwasyon’. - lesson two: Being competent, using modern and right technology pay off. - When we did EDSA in 86’, the world felt the same way about us. Tuloy ang ikot ng mundo. - People resonate with unity, courage, competence, indomitable spirit everywhere. Today, Chile is the embodiment of all these. 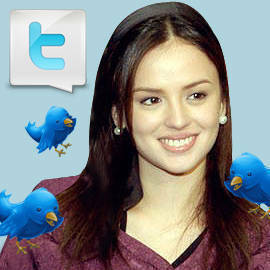 - How effective really is social networking in info dissemination? Specially with reference to the grassroots and brgys? Is it over-hyped? - That’s exactly the point. Delivering the message still requires the tri-media approach. Social networking merely compliments it. - In delivering a message, the method of delivery, to effect maximum dissemination is very essential.